Cure Vent Disease with Antibiotic Ointment? Nope. Have you ever had someone tell you that they cure vent disease with Neosporin? I’ve heard it, but find the treatment lacks a basic understanding of vent disease, the rabbit form of syphilis. No ointment can cure it. If you think you’ve cured vent disease with an antibiotic ointment, either you cured hutch burn or your rabbit has just become an asymptomatic carrier. Ointment is not the acceptable protocol for vent disease. I believe hutch burn is often confused with vent disease because many people have never seen the actual lesions, ulcerations, and scabs caused by vent disease. When they see vent irritation, they assume vent disease. Hutch burn is simply when the vent area gets scabby and dirty. Unless it creates secondary infections, the cure for hutch burn is antibiotic ointment and a routine cage cleaning. But that’s not true vent disease. Vent disease is caused by and spread through a spirochete, Treponema paraluicuniculi (T. paraluiscuniculi for short). This spirochete travels through the blood system of the rabbit. Thus no ointment can eradicate vent disease. Besides lesions, ulcers, and scabs on and surrounding the genitalia, rabbits can infect themselves on the nose, eyelids, and mouth with the same lesions, ulcers, and scabs. Bucks often have a start-shaped scar on their scrotum. 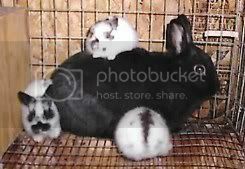 In addition to the sores and scars, rabbits experience physical interference with breeding, decreased conception rates, more retained placentas, and greater nest box losses (neonatal deaths). Uterine infections can also increase. And remember, these more serious problems can occur with no sores whatsoever. Interestingly, does that have had six or more litters are often seropositive as are bucks that have been breeding for 6 to 12 months. That means that an active breeding history means your rabbit is likely to have vent disease, whether or not you see symptoms. According to Ferrets, Rabbits, and Rodents: Clinical Medicine and Surgery by Katherine E Quesenberry and James W. Carpenter, my source for this article, penicillin G benzathine-penicillin G procaine (sold as Combi-Pen and commonly referred to as pen B) administered at 7-day intervals for 3 injections (42,000 to 84,0000 IU per kilogram of rabbit weight given subcutaneously) is an appropriate treatment. My Combi-Pen has 300,000 IU per milliliter. A 4-lb. rabbit weighs 1.8 kg. The range for a 4 lb. rabbit is therefore 75,600 to 151,200 IU or 1/4 to 1/2 mililitters or cc’s. The convention many breeders use is 1/10 cc per pound. Please make your own calculations and consult your vet before administering medications. If you use Pen G, then you must give it for 5 to 7 days straight intramuscular. I find this treatment harder on the rabbit’s GI tract, though, and harder to administer. Other breeders have found that vent disease is more likely to reoccur with the Pen G treatment. There are many things that can affect nestbox outcomes: the weather, fluctuations in feed, the season, and your rabbits’ genetic predispositions. But if your herd once produced well and is experiencing many of the problems associated with vent disease over a period of time, considering treating your herd.